The US Environmental Protection Agency (EPA) maximum contaminant level (MCL) for arsenic is 10 micrograms/liter (parts per billion). That isn’t much. Arsenic is very potent stuff. Partial paralysis, numbness in hands and feet, blindness, thickening and discoloration of the skin (see the hands of the arsenic-poisoned man below). The following is excerpted from “Arsenic-Laced Well Water Poisoning Bangladeshis,” from the National Geographic News for June of 2003. You will note the irony of well-meaning effort at aid going wrong. A dam is a blessing for some and a curse for others. Possibly the largest mass poisoning in history may be underway in India and Bangladesh. Pollution is not to blame. The culprit is arsenic in the drinking water, a natural phenomenon in several parts of the world, but which is particularly severe in South Asia. Arsenic in ground water is caused naturally mainly by minerals dissolving from weathered rocks and soils. Exposure to high levels of the toxic element can cause cancers of the skin, bladder, kidney, and lung, and diseases of the blood vessels of the legs and feet, as well as possibly diabetes, high blood pressure, and reproductive disorders. How many Indians and Bangladeshis are exposed to a high level of arsenic in their drinking water? According to the World Health Organization (WHO) in Geneva, estimates vary from a low of 28 to 35 million to a high of 77 million—more than half the population of Bangladesh, one of the most crowded nations. It is estimated that over a million Indians are also drinking arsenic-laced water. Newer cases of arsenic poisoning in the Ganges Basin suggest that many of the region’s 449 million residents could be at risk. Dipankar Chakraborti, a researcher at the Jadavpur University in Kolkatta, India believes that more than 50 million people are exposed and thousands are already showing symptoms of poisoning. Bangladeshis are being poisoned—usually without knowing it—by drinking water drawn from wells. 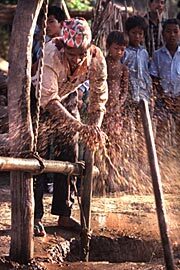 Three decades ago health and development experts, and small local contractors, dug millions of deep tube wells throughout Bangladesh. The experts encouraged the whole nation to drink well water because it was deemed to be safe, free of the bacteria that causes water-borne diseases such as diarrhea and other intestinal maladies that have long plagued the tropical country. But in switching from rivers and other surface sources of water, the people of Bangladesh may have exchanged water-borne diseases for slow poisoning by arsenic. In the 1970’s public health specialists and government policy-makers were unaware of the problem. It was only in 1993 that “clean” well water was discovered to contain dangerous quantities of the poison. “It is a terrible public catastrophe,” said Allan H. Smith, professor of epidemiology at the University of California, Berkeley, and a WHO consultant who has investigated the problem in Bangladesh on several trips. The number of people affected by the arsenic disaster ranks with those being threatened by the biggest killer diseases. “By virtue of its sheer size it is pushing the limits of our knowledge and capacity to respond to it,” said Hans van Ginkel, rector of the United Nations University in Tokyo. In a new effort to alleviate the crisis, the United States Geological Survey (USGS) is undertaking a project in which integrated geologic, hydrologic, and geochemical approaches will be used to develop criteria that will identify and map sources of safe or low-arsenic ground water. This involves the digging of new deep bore wells which might help determine arsenic levels in both the Meghna and Ganges river basins. According to the USGS the purpose of drilling these deep wells is to get a better definition of the deep aquifer system and to see if—at least in some areas—it may provide a viable source of potable water, free of arsenic. WHO’s most recent guideline for the maximum amount of arsenic in drinking water recommends 10 parts per billion (ppb). That was in 1993 when it was lowered to that level from 50 ppb. But most water consumed in arsenic-affected areas in Bangladesh has substantially higher levels, frequently far above 50 ppb. Arsenic-contaminated water is not restricted to developing countries. In the western states of the United States of America about 13 million people drink arsenic-tainted water, albeit less contaminated than the well water in Bangladesh. Australia, too, has arsenic-contaminated water. So do Argentina, Brazil, Chile, Hungary, Mexico, Taiwan (Province of China), Thailand, Vietnam, and the eastern areas of India in Bengal. 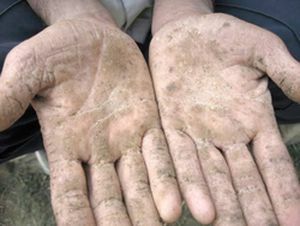 Arsenic poisoning is recognizable from skin color changes, blotches all over the face and body, hyper pigmentation on the chest and upper arms, hard patches on palms and soles of the feet, inability to walk, debilitating pain, and watery eyes. In the developed world, sophisticated methods of arsenic treatment exist. US well owners avail themselves of reverse osmosis, specialized filtration and ion exchange technologies to remove arsenic from water that tests a few parts per billion over the 10 ppb MCL. These technologies are not available in Bangladesh and other poor regions. A variety of simple filters have been devised to address arsenic poisoning in these regions with varying degrees of success. For more information about arsenic and treatment of arsenic, please go to the Pure Water Occasional’s Water Treatment Issues section.